I love how this dish makes me feel so energized and clean after eating it. It is also super easy to make, and a great way to squish in some more veggies. Inspired by a meal I was served last year in a local pub, this dish surprised me in terms of how filling and absolutely delicious it was. I just couldn’t wait to go home and re-create it. I am definitely not the biggest fan of kale but it does certainly earns it’s place in this dish. 2 Tbls extra virgin olive oil, Squeeze of half a lemon. Grate in 1/2 clove of garlic. Season with salt & pepper. Mix, taste and add more lemon juice if required. If it is too lemony, add more extra virgin olive oil. Mix gram flour & water together to form a batter consistency. Ladle the batter into a greased frying pan on medium heat. Once lifting around the edges flip to cook the other side. Cut into wafers. Cook quinoa according to package instructions. Drain and allow to cool completely. Blanch kale, broccoli & the peas in boiling water to remove the rawness, but you still want these fairly crunchy. I usually blanch the broccoli in a separate pot of water as it takes a little longer. If you like very crunchy broccoli though you could blanch them all together. Once blanched, plunge them into an ice bath to stop them cooking further. Drain and allow all of the water to drip away. For best results put them in the fridge for half an hour. I usually prepare the veggies and quinoa the day before and have them ready to go in the fridge for throwing together last minute. Or I may have them left over from another meal in the fridge anyway. 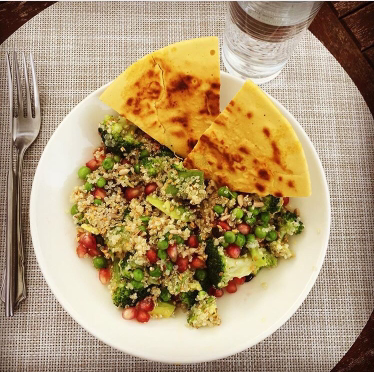 Mix all salad items together – quinoa, broccoli, kale, peas, pomegranate, avocado & seeds. Season with salt & pepper. Make dressing. Toss salad in the dressing to coat. Make chickpea flatbreads (optional) and cut into wafers (also optional! ).